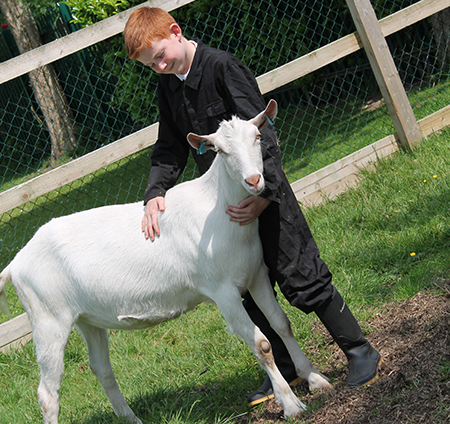 Did you know that we’ve a new animal addition at our school called Buster and he’s a goat? Buster is a four year old Saanen goat. Goats are tremendous animals. They are tough, versatile and have many uses. Goats can survive and thrive just about anywhere, They are hoofed mammals in the genus ‘Capra’. Most are referred to as domestic goats, which are sub-species of the ‘wild goat’. Goats are known for eating everything! They are curious, so they will try to eat cardboard, tin cans – even clothing! But to stay healthy, goats need to eat plant material. Goats favourite treat are apples! Because our school field is covered in football pitches that are used by the wider community during the weekends and sometimes after school, signs are put up to stop people feeding Buster too many treats! Buster’s habitat is our school grounds (playing field and forest) and he’s also got his own little pen next to our pigs! He is happiest when he being taken for walks, having his ears scratched, or when he is in the company of the chickens – he doesn’t like being alone. Jane, our caretaker, looks, after our cute, friendly goat. She feeds him a variety of different foods. Also, she washes and takes really good care of Buster. 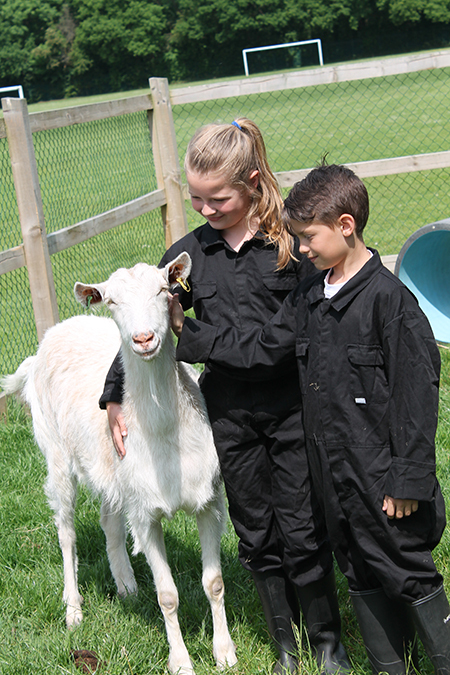 At ‘Animal Club’, children get the chance to help clean out Buster’s pen, wash him, check he has enough food and water, and play with him. Having Buster at our school is an educational experience as we can study his behaviour, do observational drawings of him, learn about his diet and habitat and experience the responsibility of looking after another living being. Not only do kids enjoy having Buster, the adults at school adore him as well!